1stdibs (Firstdibs) lets you shop a curated mix of the finest objects in the world — from furniture and fashion to jewelry, fine art and collectibles — from the world’s most notable sellers and galleries. Whether you're searching for authentic Eames furniture, scarce Hermes, Art Deco decor, Cartier jewelry, Patek Philippe watches, an original Warhol or Picasso - or just want to explore and be inspired - 1stdibs is your destination for one-of-a-kind pieces. 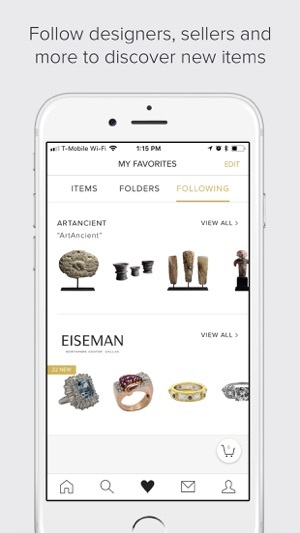 Easily search and browse beautiful objects, explore pieces in the Firstdibs Gallery in NYC, set custom notifications for new arrivals, curate your own collection of favorites, send messages to sellers, and check out directly from your phone - anywhere, anytime. 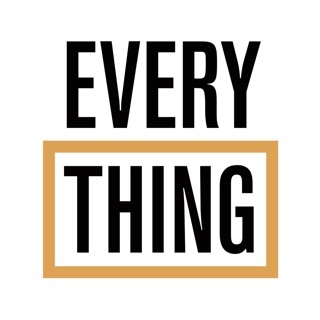 A DIVERSE YET CAREFULLY CURATED MARKETPLACE - Shop one-of-a-kind furniture, fine art, jewelry, and fashion from a roster of the world’s most prestigious sellers and galleries who hand-select their collections. DISCOVER AND FIND INSPIRATION - With almost a million beautiful pieces in a single place, we make it easy to find what you’re looking for. 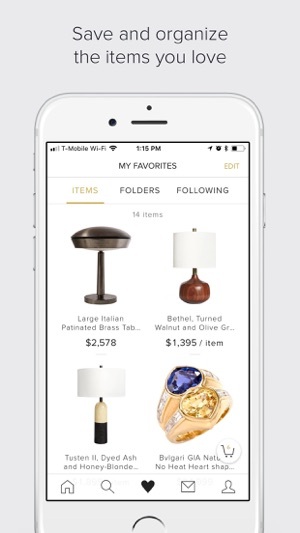 Discover new pieces weekly when you follow a search or favorite dealer and create a collection of your favorite pieces. 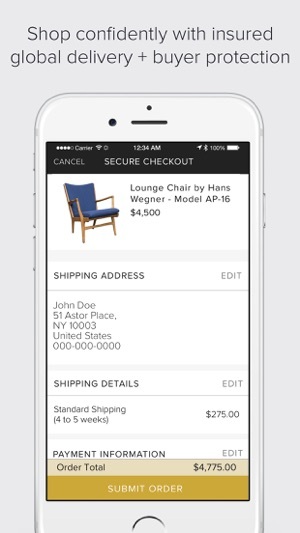 SHOP WITH EASE AND CONFIDENCE - We offer secure checkout, with convenient payment options including PayPal, or wire transfer (in addition to credit cards). We also provide the best global shipping options, thanks to our scale. 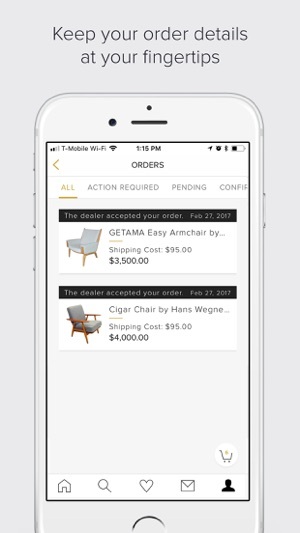 Whether you’re at home, on-the-go or in one of the thousands of Firstdibs sellers’ retail locations, all purchases made via our secure checkout are eligible for the benefits of our buyer protection program. INTERIOR DESIGN AND PROCUREMENT SERVICES - Try our designer connection service to help you find the right interior designer or leverage our client services team to source specific pieces for you. EXPERT CONSULTING - Our Art + Design Research team can provide guidance and a detailed review, appraisal, and authentication of any piece you're interested in. INSPIRATION AND EDUCATION - Read and learn about the best in design, fine art, fashion and more in Introspective Magazine and The Study blog. 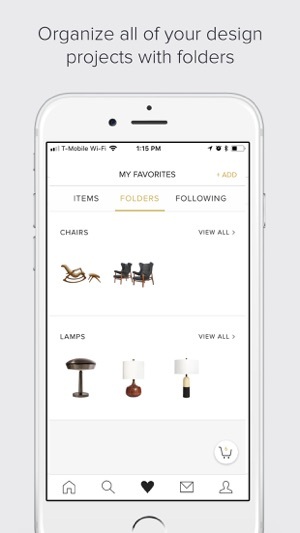 Please send your thoughts to appfeedback@1stdibs.com or click “Send Feedback” in your settings. 1stdibs is an expertly curated marketplace of the world’s most beautiful objects: from one-of-a-kind antiques and modern furniture, to jewelry, vintage fashion and fine art. But we didn’t get where we are without input from our customers. That’s why we’d love it if you could take a moment to rate us in the App Store. 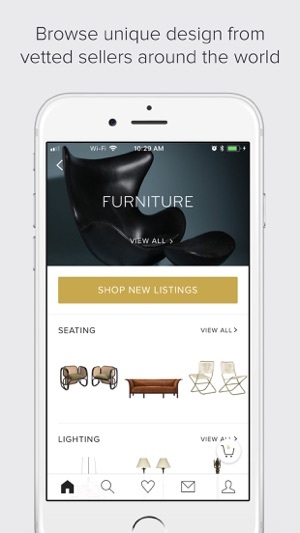 1stdibs is the world's leading online marketplace for rare and desirable objects. Founded in 2001 to bring the Paris flea markets online, today the website is the go-to source for those who share a passion for the most beautiful things on earth. By bringing together the best furniture, fine art, jewelry, and watch sellers from more than 600 cities around the world, 1stdibs offers an exclusive inventory not available anywhere else online. You can trust all their venders for being the BEST. 1stbids has done all the vetting work for us. You can even negotiate prices for most of all the items. I have purchased a used Alexander McQueen clutch this year, asking price $700, the vender accepted my $380 bid. I also bought a 2.1 carat 1890s vintage diamond ring for my 10th wedding anniversary. The jeweler asked for $11k. We negotiated back and forth and purchased it for close to $8.5k. All the official paperwork and documents were included. I had it appraised at two different jewelers and it appraised for close to $12k. You can trust this site. I am remodeling my home and can’t wait to see what artwork, furniture, and decor I can bring home next. 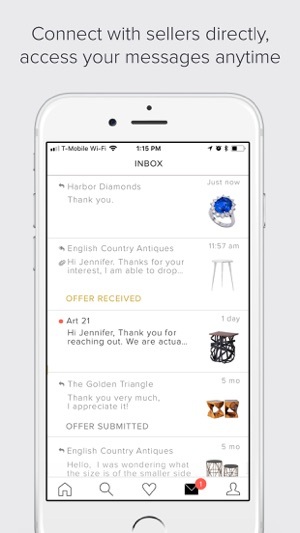 1st Dibs is a more upper class curated shopping resource that allows users to purchase fine art, furniture, fashion and jewelry from dealers. As a result the service is a bit more personal allowing you to make offers and speak with sellers directly. 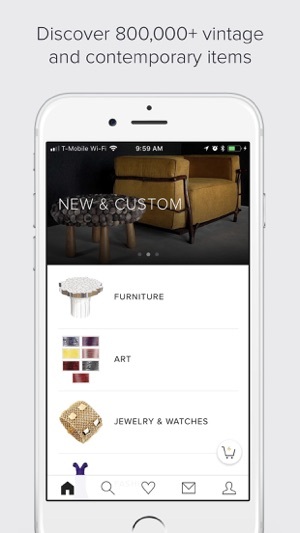 Users can use the app to shop for art by select well renowned artists, place furniture pieces in your space to get an idea in how it looks in a particular spot as well as filter shopping for other categories as well. The design itself is simple with a minimialist UI and a white background which makes it easy to browse for something you might be searching for.